If you have a kitchen reno in mind and have narrowed down your countertop selection to granite or quartz, you may be asking yourself what the difference is (and more importantly, which one is better for your needs). Understanding the differences between these two materials can help you choose the best one to suit your lifestyle and your budget. Here’s the low down on granite versus quartz. Granite is a 100% natural stone material that is exceptionally hard. Granite is sourced from mines and is then cut and polished to become your countertops. One of the famous features of granite is its appearance. Whether you want to add subtle design flair to your kitchen or are looking for a bold, striking look, granite offers so many different, unique slabs to choose from. Every single cut is different from the next, which makes it extra unique and appealing. The price of granite can range anywhere from approximately $2,000 to $4,000 for an averagely sized countertop, depending on the size and style. And when you purchase, keep in mind that granite should always be handled and installed by a professional. Granite should be cleaned each day with mild soap and water. Avoid using anything sharp and abrasive. To ensure your investment stays in pristine shape for many years, we also recommend having it resealed each year. Quartz countertops are actually man-made and although they consist of 90% quartz, the rest of the countertop is composed of resins, polymers, and various types of pigments. This creates a very durable artificial rock without pores or cracks. The dye is used to provide coloration that is naturally found in quartz. Quartz blends natural stone with the ability to customize the appearance of it to match your design. That’s why it has become such a hit among homeowners. It offers more selection and a finish that can be more tailored to your liking. 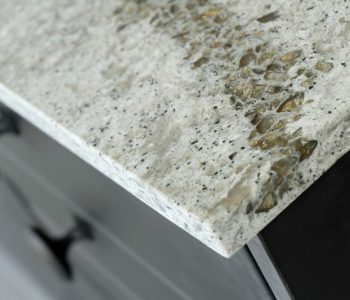 Similar to granite, the price for quartz usually starts around the $1,500 mark and can reach up to $5,000 plus, depending on the size and design. Quartz is also very heavy and should always be handled and installed by a professional. Quartz provides a low amount of maintenance in comparison to granite, thanks to the solid surface. This means that you won’t need to worry about resealing it every year. Instead, clean it with soap and water, and be sure to wipe away any stains once they occur. When you’re ready for a kitchen reno, allow our team at Granstone to help you achieve your dream kitchen design. We are the experts in Ottawa when it comes to craftsmanship, product selection, and customer service. Contact us today to learn more.